I was recently interviewed by journalist, Martin Green for Catalyst, the Chartered Institute of Marketing’s member Magazine. We talked about how bartlett mitchell has risen to the challenge of providing more sustainable and healthier contract catering. First we discussed the media pressure supermarkets have come under and public scrutiny over marketing food responsibly and whether this places pressure on providing healthier contract catering. We know customers don’t change into different beings when they come to work. They expect the same service and experience at work as they receive in cafes, restaurants and supermarkets they use when they are not at work. Even the discount brands put a massive emphasis on their food’s provenance, recognising that this is important to customers. Being transparent about the ethics of our supply chain is a greater responsibility for us, because customers consume about a third of their daily intake of food at work. Our clients see it as part of their corporate responsibility to provide their employees with a quality diet and there is a sound business case for this. If teams eat well, they are productive, and a healthy workforce has reduced sickness and reduced absence. There is also a reputational aspect to this for business who want to attract the best employees. ‘Aspirationals’ who make up an increasingly larger part of our customer base have been identified as customers who believe we need to “consume a lot less to improve the environment for future generations”. We see evidence of this in the comments and questions we receive on social media. So the added impetus to be a sustainable and healthier contract caterer comes from both our customers and our clients. Next we discussed why bartlett mitchell sets its stall out very clearly when it comes to food quality and sustainability. And has this proven to be a winning formula, in terms of market differentiation? Procurement departments in B2B clients definitely want to know that we are a sustainable and healthier contract caterer. Because of our size and independence, we can choose to support initiatives that other companies can’t and our agility means we can make an impact quickly. Selling Thirsty Planet water is a good example of this. bartlett mitchell was awarded the Sustainable Restaurant Association’s (SRA) Sustainable Caterer of the Year for three successive years which gives clients external independent validation of our policies and processes. We have found that clients positively seek us out because of our SRA accreditation. Provenance and sustainability make a big difference for our teams – chefs are attracted to work for us because they can cook with great ingredients and people want to work for ethical companies. In our annual team survey, our csr is highly regarded and one of the reasons people say they choose to work for us. And for customers it enhances their employee experience because if they’re working somewhere where the ethical and healthier food is served it makes them feel valued. And customers do notice, I have been pleasantly surprised at the level of knowledge customers demonstrate in their comments about our food ethics. As the company’s senior marketeer, I am responsible for presenting our corporate responsibility credentials. It is wrapped up in our ‘Fruitful world’ plan. Sustainable catering for us is the integration of social, environmental and economic initiatives. Our ‘Fruitful World’ business plan combines long-term profitability with maximum social responsibility and environmental care underpinned by integrity, courage, respect and transparency. By using three pillars of sustainability as a framework we have created a balanced approach to achieving triple bottom line results for people, planet and profit. We provide the information about our biggest issues and the stories behind them. And we use all the channels that we have at our fingertips, chosen to be relevant to the audience. We communicate intelligently. No one wants to be preached to. I feel this open style of communication encourages customers to ask us questions. ‘Read your wrap’ which provides transparent and accurate information about our ethics and provenance is a good example of this. We are not trying to say we have achieved everything we want to in this area yet, but we are on a journey we want our customers to share. I make sure our communications appeal to everyone whether they’re a skimmer, pick ‘&’ chooser or a detail person. Some customers just want the headlines and the reassurance. Procurement departments want the detail and the FM team are looking to pick relevant information for their organisation. I was asked whether the bigger industry players’ approach to healthy eating had affected our marketing stance. Healthy food is hard-wired into our DNA – our brand essence is ‘fundamentally food’. 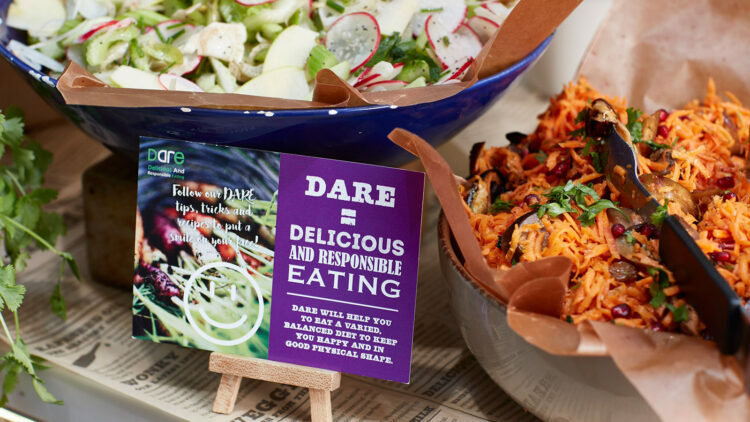 We established a healthy eating programme called DARE on day one, because we believed it made sound business sense and it was the right thing to do. Our ‘Eat well the DARE way’ empowers customers to make informed decisions about what they eat. DARE stands for Delicious And Responsible Eating. In 15 years DARE has gone from strength to strength, all DARE foods are nutritionally analysed and listed on the MyFitnessPal app. This allows customers to link what they eat at work to their health and fitness goals. I was asked to look into the future of ‘Healthy and lifestyle eating’, whether it’s a fad or here to stay. The definition ‘Healthy eating’ means different things to different people. It can be an aspiration or an ambition. Overall we notice that people are definitely more interested in healthier foods as part of their lifestyle. I see the change in people’s food shopping habits and the types of places, chefs and cook books that have become more popular. Scanning social media channels you get a glimpse of this from the images that people share. Sustainability is like a genie that’s out of the bottle. We have a role in exploding some of the myths around diet; not scaring people but encouraging a sensible, pragmatic approach to eating well. If you are a member of the Chartered Institute of Marketing, you can read the full ‘Food for Good’ article here.